According to the Monterey Bay Aquarium seafood watch, wild-caught Alaskan salmon is a sustainable food option, or a “best choice” for your health as well as the environment. Lower in saturated fat than beef, salmon is a heart-healthy fish. It is richer in omega-3 fats, a type of health-promoting unsaturated fat, than most other fish varieties. Like most animal foods, it is rich in protein as well as many vitamins and minerals essential for human health. Salmon is rich in many B vitamins. According to the USDA National Nutrient Database, a cooked portion of wild Atlantic salmon provides 0.828 milligrams, or 48 percent of the recommended daily value, for vitamin B-2 and 17.13 milligrams of vitamin B-3, or 84 percent of the DV. These vitamins are important for energy metabolism as well as proper nervous system function. The same amount of cooked Atlantic salmon provides 1.6 milligrams of vitamin B-6 and 5.18 milligrams of vitamin B-12, or 80 and 86 percent of the DV for each nutrient, respectively. Vitamin B-6 helps break down stored energy, in the form of glycogen in the liver and muscles, into glucose to keep blood sugar steady. In addition, vitamin B-6 is essential for protein metabolism and synthesizing neurotransmitters or brain chemicals, such as serotonin, which regulates bodily functions. Vitamin B-12 is important for energy metabolism, supporting proper function of the nervous system and forming new cells. Most varieties of seafood are rich in minerals, particularly the trace mineral selenium, and salmon is no exception. A 6-ounce cooked portion of wild Atlantic salmon provides nearly 80 micrograms, meeting over 100 percent of the DV of 70 micrograms. According to an article published in the “American Journal of Clinical Nutrition” in July 2004, a low intake of this mineral may contribute to reduced immune function, increased risk of developing cancer as well as increased susceptibility to viral diseases. 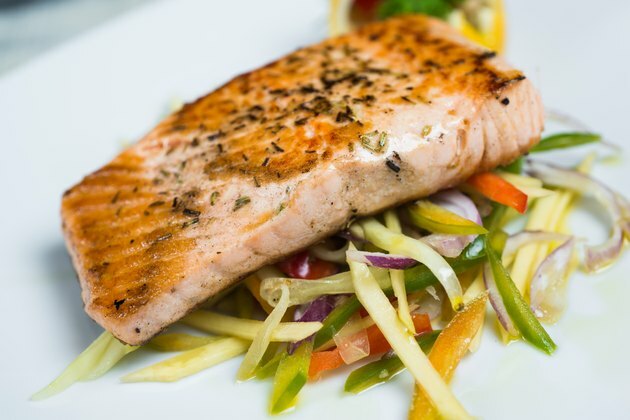 Salmon is a source of the major minerals phosphorus and potassium, meeting 42 and 44 percent of the DV for each in a 6-ounce cooked portion, respectively. Phosphorus is needed to build and maintain strong bones. It activates certain enzymes and is necessary to form DNA. Potassium is important for regulating heartbeat and maintaining healthy blood pressure. According to an article published in October 2006 in the “Journal of the American Medical Association,” consuming fish, especially fish rich in omega-3 fatty acids, such as salmon, promotes optimal health of the cardiovascular system. Researchers reported that eating two 4-ounce portions of fatty fish weekly, or those rich in the marine omega-3 fatty acids known as eicosapentaenoic acid, or EPA, and docosahexaenoic acid, or DHA, such as salmon, reduces overall risk of dying by heart disease by a significant 36 percent as well as total mortality by 17 percent. A 6-ounce portion of cooked salmon provides more than 3 grams of EPA plus DHA — and this amount has shown cardioprotective benefits. Omega-3 fatty acids may also help prevent high blood pressure, high cholesterol, diabetes, arthritis, systemic lupus, osteoporosis, depression, cognitive decline, brain disorders, skin disorders, asthma and breast, colon and prostate cancer, according to the University of Maryland Medical Center.